and the time to lead is now. Lori develops world-changing women, helping them move from being overwhelmed by busy-ness to leading fulfilling careers and lives with fewer limits. As a women’s leadership coach, I guide women to create a simpler path to more professional and personal freedom and greater license to choose their way forward. Guiding professional women to create a simpler path to more professional and personal freedom, Lori grants her clients license to choose their own way forward. 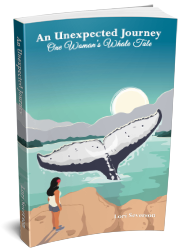 An accomplished fiction writer and author of the Amazon bestseller, An Unexpected Journey: One Woman’s Whale Tale, Lori takes readers on an exploration of how one person can make a difference. Lori’s mission is to guide women home. As a speaker, Lori inspires women to return to themselves while leading deeper, more fulfilling lives. Join the mailing list to receive the latest blog posts, and updates about future book releases.